Crocheting a beautiful baby blanket is quite easy, and you can stitch one up in any color you desire. This pattern uses four basic stitches: chain stitch, slip stitch, single crochet, and double crochet, to create a lovely shell pattern. The printable pattern is suitable for an advanced beginner or an intermediate crocheter. To download this free crochet pattern, click on the image to open the PDF file. For help and troubleshooting with Adobe printables, try these helpful tips. 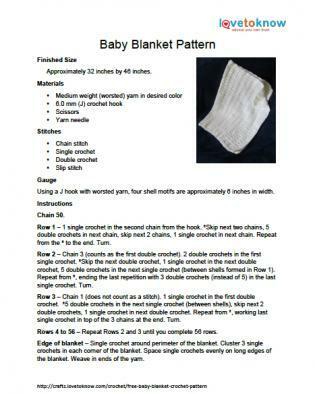 Download this baby blanket pattern. The sample here was made with an inexpensive worsted-weight, washable yarn. Although the sample is ivory, which is suitable for a boy or a girl, it can also be made with variegated yarn or with a bright or pastel solid-colored yarn. The shell pattern provides visual interest and texture, as well as assuring warmth, without difficult yarn color changes. 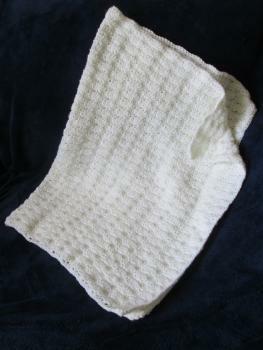 The sample blanket was made with Lion Brand "Pound of Love" yarn in antique white. Although gauge information for the recommended yarn and crochet hook size is provided, gauge is not terribly important for this project. The width of the blanket can be increased or decreased easily; the base chain for the pattern should be in multiples of six, plus two extra stitches at the end for turning. The length of the blanket can be increased or decreased based on the number of rows completed. You can work this blanket up quickly because it features the same repetitive shell pattern throughout. Once the initial rows are created, it is very easy to continue the pattern with little counting. At the end of the blanket, finish with a slip stitch and leave enough yarn to weave invisibly into the blanket. 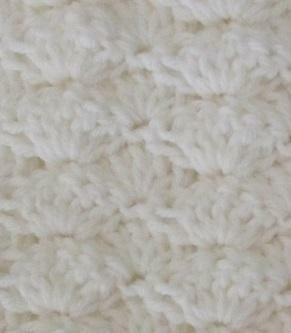 The blanket has a simple edge consisting of a single crochet around the perimeter. This blanket lets you quickly create a one-of-a-kind gift. Before you present the blanket to new parents, be sure to wash it in a gentle detergent, such as Woolite or Dreft, so it is ready to use right out of the gift box. Once you've folded the blanket for wrapping, consider bundling it with a colorful ribbon.